Wow, the prominently credited Benedict Cumberbatch sure was great in this movie, in his dual role as the non-appearing necromancer and the non-speaking Smaug. Was Radagast really designed with his face half-covered in birdshit? It was actually disappointing to see Peter Jackson falling into that stereotyped orange-and-teal color-grading pattern in the goblin caves. That said, the Great Goblin was a hoot. He could have just been a bigger version of his gibbering, apelike people, but his wry sophistication and sense of lighthearted glee at his life are an awful lot of fun. But anyway. Simple question here: When Azog gets Thorin down and Bilbo comes to his rescue, what exactly are all the other dwarfs doing? (At least, the ones who aren’t dangling from a branch, about to fall to their deaths.) These are a group of honor-driven, exceedingly proud individuals who think of themselves as loyal-to-the-death warriors and are constantly out to prove it… and they just stand meekly by while a hobbit saves their leader? 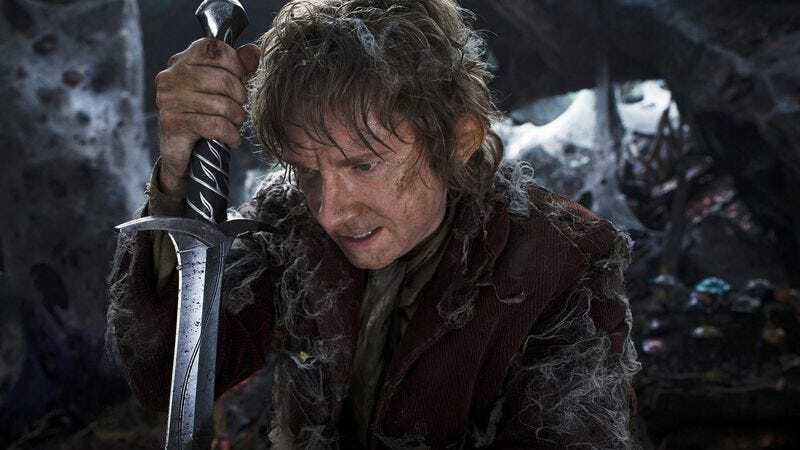 There’s some awfully unlikely stuff in Unexpected Journey, starting with 13 banging, oblivious loudmouths sneaking out of Bilbo’s house without waking him in the morning, and ending with that exceedingly videogame-y goblin-caves scene, which looks like it would have killed all involved 50 times over if they weren’t so obviously CGI constructs. But the moment where everybody just stands around with their dwarven-mailed thumbs up their dwarven-mailed asses while Bilbo saves the day is reaching too hard for uplift at the expense of logic.